Houston electrical new construction is one of our many specialties at Highlights Electrical. For nearly twenty-five years, we have worked with general contractors on a various array of projects and have consistently provided expert installations for a reasonable price in the time frame required by the owner. Please give us a call today at 713-266-6464 to receive experienced, friendly assistance from the professionals at Highlights Electrical who are always happy to answer any electrical contracting and lighting questions or to schedule an appointment to meet with one of our qualified representatives. We have successfully completed many individual projects that range in size from a few thousand dollars to well over a million dollars. We have the capacity to handle a tremendous volume of work, due in part to the skillful management techniques employed at Highlights Electrical. We emphasize cost-effective and efficient production as the keys to successful installations, which benefit both the General Contractors we work for and ultimately the owner of the finished product. Our range of electrical new construction expertise spans projects of all types and descriptions: Retail centers (large and small), educational facilities (schools, early childhood centers, colleges etc. ), healthcare facilities (hospitals, clinics, urgent care centers, elder-care facilities), municipal projects such as water treatment plants, municipal utility district facilities, communication facilities, radio stations, television stations, churches and other houses of worship, sports venues and many others. We are also one of the most experienced Electrical Contractors in the Job Order Contracting (JOC) facet of this industry. Our specialized techniques are tailored to fit the complex activities that are often required in this fast track arena of work. We continue to be one of the leaders in this electrical contracting industry in JOC performance contracting. 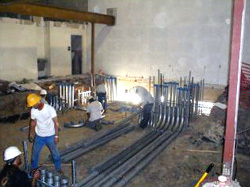 Design and build construction is also a valuable part of our arsenal of expertise. We have the capability to design your project from the ground up, or we can assist and evaluate your project and advise you on your available options. Once your budget has been established, we can demonstrate how you can get the maximum for your construction dollar. From the initial design phase, to permitting, throughout construction and through the final walk-through and occupancy, Highlights Electrical has successfully been a reliable source for Houston’s planners, architects, engineers, general contractors and business owners. Become part of our success. Let us help build your vision of the future. No matter what type of project you have, from the small lease space to the large scaled projects, Highlights Electrical has the expertise, experience and the staff to provide you with our ultimate goal - customer satisfaction. Become one of our many satisfied customers today! Upon request, one of our helpful and expert Highlights electrical staff will point you to any of our many successfully completed electrical new construction projects in Houston. We look forward to any opportunity to serve you and your new construction needs. Please call us at 713-266-6464.